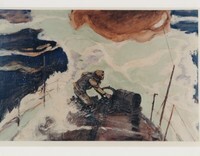 Professional photograph taken at the Hotel Statler in Washington D.C.
A photograph of a painting of a man on a ship during a storm. 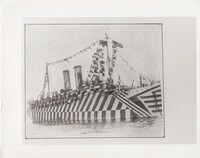 A photograph of the British ship named Queen Elizabeth. A photograph of a camouflaged Bi-Plane. 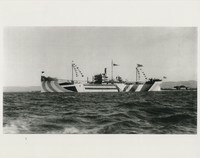 A painting by John Olaf Todahl titled "The Submarine Chasers"
A photograph of one of the big liners converted for trooping and escorted by U.S. destroyers. 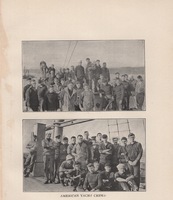 A photograph of the sinking of the United States steamer "Convington"
The surrender of a U-Boat to the American destroyer "Fanning"
German prisoners captured by "The Fanning"
Photographs of the sinking of the torpedoed Transport "Convington"
The Transport "Mount Vernon in dry-dock at Brest being repaired. 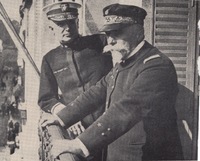 Rear Admiral H. B. Wilson and Vice Admiral Schwerer, the American and French chiefs of the Brittany Patrol. The hole made by the torpedo in the side of the "Finland"
The USS Finland after being torpedoed; the starboard side is wet from the eruption. 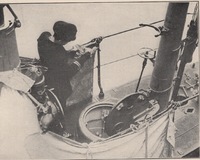 A lifeboat is seen at the left and the Alcedo hurling the sub at the right. A portrait of a man. Possibly an engineer at Kodak. 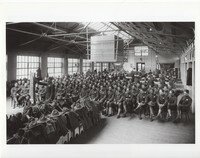 Class of army school of aerial photography at Kodak Park. 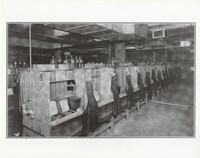 School of aerial photography developing room at Kodak Park. 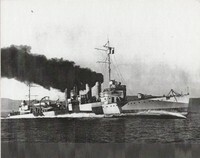 At a distance of two miles, this type of camouflage made it almost impossible to determine the kind of ship. 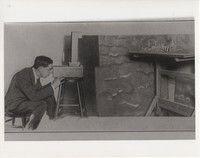 Sighting a camouflaged ship model through a specifically designed periscope to test visibility at various distances. 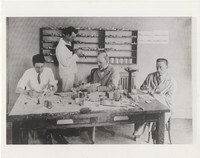 Kodak engineers busy designing types of ship camouflage. 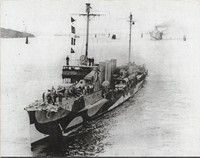 A photograph of the refrigerator ship Oskawa. 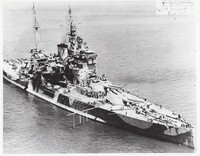 A port bow view of the Battleship USS Utah. A starboard beam view of the Destroyer USS Fanning. A port bow view of the Destroyer USS O'Brien. A starboard bow view of the Destroyer USS Ward. 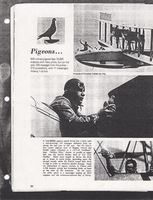 A newspaper article about the use of homing pigeons by the Allies in World War II. 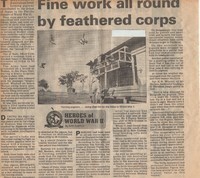 A newspaper article about Sgt. Lucas, A US Army Pigeonier. A page from a book about pigeons during World War I. 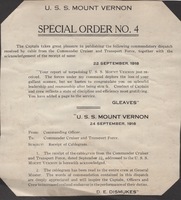 A commendatory dispatch from the Commander Cruiser and Transport Force to the Captain and crew of the USS Mount Vernon for the leadership and conduct of the Captain and crew after being struck by a torpedo. 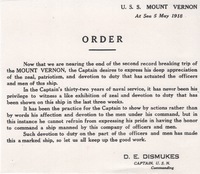 An order from DE Dismukes, the Captain of the USS Mount Vernon, commending his crew for their dedication to duty. 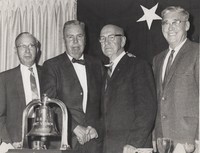 Four men standing and shaking hands in front of the USS Mt. 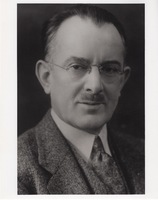 Vernon Bell. Picture taken aboard the USS Agamemnon. 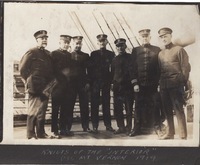 Portrait of a group of men on the USS Mt. Vernon. 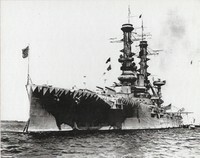 A photo of the USS Agamemnon en route to France. 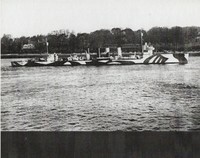 Photo taken from the USS Mount Vernon. 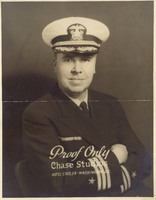 Captain DE Dismukes, Commanding Officer of the USS Mt. 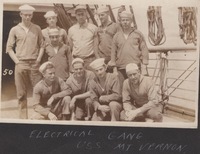 Vernon, and "Jerry" the ship's mascot. The propeller actuating device from the nose of the German torpedo found in the No. 7 Fire room on the USS Mt. Vernon. USS Mount Vernon in drydock at Brest, France showing torpedo damage. 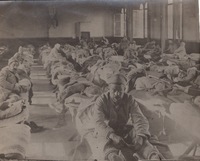 The troops in the mess hall of the USS Mt Vernon. The USS Mt. Vernon, the Former German Passenger Liner Kronprinzessin Cecile, in New York Harbor. Secretary of the Navy, Josephus Daniels, firing a Boiler on the USS Mt. Vernon. 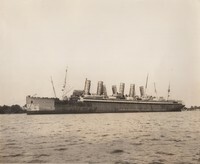 A photo of the Kronprinzessin Cecilie in the New York harbor. 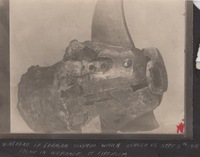 Propeller Actuatine Device from Nose of German Torpedo Found in the Fireroom Bilge after USS Mount Vernon placed in drydock . A man standing on a dock near some ships. Reiherstieg shipyards and engineering factory, Hamburg, KI. Grasbrook. 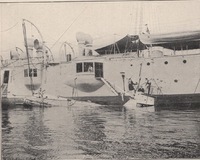 A German steamer built at the shipyard for the German East Africa Line. Dismukes, D. E. & Doyle, "Jimmy"
Captain DE Dismukes and Dog "Jerry" on the USS Mount Vernon. 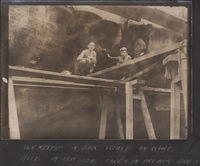 A photo of the hull of the USS Mount Vernon where it was struck by a torpedo titled "Hole In Our Side"
A portrait of Taisey standing in front of a stack of hay. 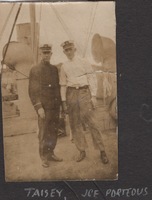 A portrait of Taisey and Joe Porteous aboard a ship. 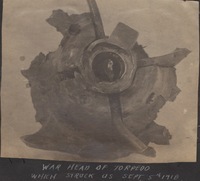 Warhead of German Torpedo Which Struck the USS Mount Vernon on September 5th 1918. 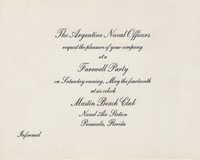 Found in wreckage of Fire room. 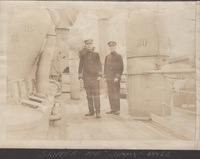 A photograph of returning troops on a ship. 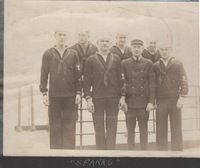 A portrait of navy men and an officer titled "Sparks"
A photograph of the bow of the USS Mount Vernon at sea. A photograph of the USS Mount Vernon being installed with reinforced concrete after being struck by a torpedo. Taken in a drydock in Brest, France. 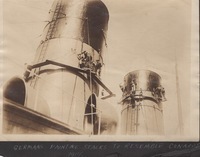 Germans painting stacks on ship to resemble a Cunarder, a type of steamship. 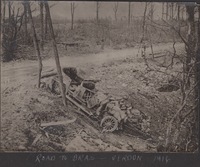 A photograph of a soldier manning a cannon. A portrait of two women standing next to each other wearing matching outfits.